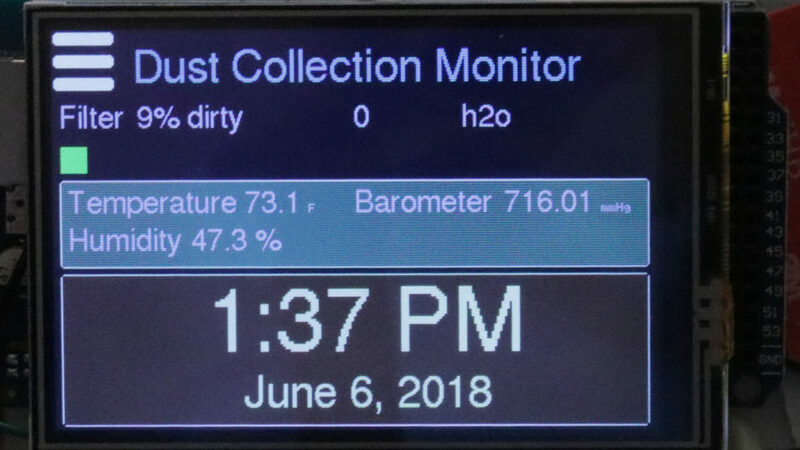 I just finished and published my first product – the Arduino Shop Dust Collection Monitor. This was a fun project for me. The display tells me when to clean the cartridge filter in my dust collector. The Dust Collection Monitor measures the pressure build up inside the cartridge filter. When the collector is on the filter pressure is displayed, which increases as the filter gets clogged with sawdust. When the pressure increases, it can help tell when it is time to clean the filter. The monitor was built fairly cheaply using an Arduino. The monitor is hooked to the Internet, and can get and display the time, the temperature, humidity and barometric pressure in the shop. The dust collector motor tracks runtime in hours since the filter was last cleaned, since the filter was new, and a total for the dust collector itself. To check it out – see my full article! Just a quick update. I’m finishing up the drawer cabinet under my new Roubo workbench. It is going great. I also found another project because my dust collection filter cartridge clogged the other day. Or it finally slowly slowed down enough that I noticed, when my jointer, then table saw, then garbage can thien filter all clogged on me. I was slow to get the point, but finally checked my cartridge filter and saw a thick cake of fine dust covering the inside.